The memorial is composed of a tall, tapered granite column, bronze plaques on the front and rear, and a bronze eagle perched atop the column. The eagle, the symbol of the United States of America, is depicted with its wings outstretched. The left and right sides of the column each bear a bronze bas-relief of an olive branch, a classical symbol of both peace and victory. The monument bears two inscribed plaques: the rear plaque is the original plaque, and the front plaque is a newer plaque, duplicating the names on the original plaque with the addition of fallen servicemen who were not included in the original. Additionally, the original plaque included the names of African American servicemen separately. In the new plaque, all servicemen are listed in alphabetical order. This monument honors the sacrifices of Iredell County citizens in World War I. Originally / dedicated on May 30, 1928. It was erected at the end of West Broad Street. After cleaning / and restoration in 2005, the monument was moved to the Walk of Honor at the Iredell County / Hall of Justice. The names of four fallen servicemen who were not included on the original / monument have now been added to the alphabetical list of names. 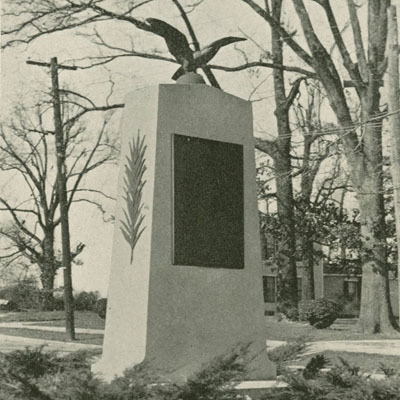 The Iredell County World War I Memorial was unveiled on a Monday, May 30, 1928, and the events of the day lasted from 10:30 in the morning to 2:00 in the afternoon. The day provided good weather for the ceremony as it was sunny and there was a breeze blowing. The unveiling and dedication ceremony to honor those from the community who lost their lives in World War I dominated the day, as banks, stores, businesses, and the post office were closed during the events. The monument was unveiled in a grassy area on West Broad Street. There were many people in the area to view the dedication and unveiling. The ceremony featured numerous local figures. Dr. C. A. Turner’s band performed patriotic music. After the band finished its performance, an invocation was given by pastor of the First Associate Reformed Presbyterian Church, Dr. J. H. Pressly. Pastor of the First Presbyterian Church, Dr. Charles E. Raynal also spoke on those veterans being honored, mentioning that “They died not only for their country, but for us all.” The monument was finally revealed by Bobby Turner, who took off the covering. This aspect of the ceremony was brought to a close by Dr. C. A. Turner’s band that played tap and “Nearer, My God, to Thee.” The people at the ceremony then moved to the Playhouse. Here, the crowd was first addressed by Commander Coite L. Sherrill before an invocation was provided by Reverend Q. O. Lyerly. A Dr. Wallace Hoffmann read the poem “I Have a Rendezvous with Death” by Alan Seeger. The mayor, J.B Roach also spoke. A World War I Veteran, Mr. Allen Adams was the primary speaker, and spoke on the sacrifice of those being honored, the need for peace, as well as the importance in avoiding further wars. After the events at the Playhouse, the graves in Oakwood cemetery of the World War I veterans being honored were decorated, which was then followed by a picnic lunch. In 2005, after restoration, the monument was moved from West Broad Street to the Walk of Honor at the Iredell County Hall of Justice. The memorial is located in the Walk of Honor outside the Iredell County Hall of Justice off Constitution Avenue in Statesville. The monument sits in the lawn next to the Iredell County World War II Memorial. The monuments are surrounded by the lawn and mature trees.